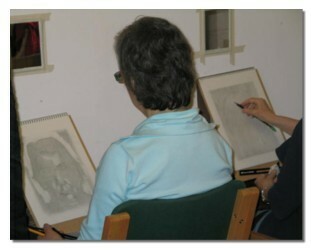 Details of the 5-day Drawing on the Right Side of the Brain course, devised by Betty Edwards. This includes links for viewing a slideshow of participants' work and reading course feedback. Artist of the Month: Albrecht Durer - includes information about forthcoming exhibition at the National Gallery, London in October. What's New brings your attention the latest areas of the website. The Big Draw 2008 will take place through October with drawing events around the UK for all ages. Find out more and mark some dates in your diary now. 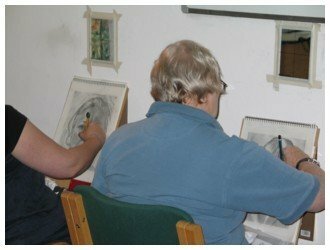 If you've always wanted to learn to draw, Dr. Betty Edwards' Drawing on the Right Side of the Brain is a proven technique for teaching drawing - particularly to those people who swear they could never be taught to draw! If you want to learn the five basic skills needed for realistic drawing you can do it in a five-day intensive course devised by Betty Edwards. Dates for 2009 I am currently finalizing some dates for spring 2009 and hope to announce them next month. As well as a non-residential course in central London there will be a residential course at a wonderful location in North Wales. Please contact me to be placed on the mailing list so you hear about 2009 dates as soon as they are announced. "Thank you for a splendid week! I've waited 13 years to do this course and it was worth the wait"
You can view a substantial body of Durer's work at the website below. This website allows you to click on the image and it will then be enlarged - and sometimes you are able to download it. So a good resource if you are looking for images to copy and practise your drawing. The following pages may be of particular interest: pages 3; 7 (Portrait of a Girl, Durer's Mother), 11 (Feet of a Kneeling Man is one of my favourites - plus studies of various heads and drapery); p.12 (Boy's Hands), p.22 (Portrait of Lucas van Leyden, Head of an Angel), p.23 (Hands). You can also see Durer's portraits - along with other great masters - in a forthcoming exhibition at London's National Gallery. This landmark exhibition explores the dramatic rise of portraiture in the Renaissance. It features works by the great masters of Northern and Southern Europe, including Raphael, Titian, Botticelli, van Eyck, Holbein, Dürer, Lotto, Pontormo and Bellini. ‘Renaissance Faces’ opens on 15 October 2008 and runs until January 2009. The Big Draw is the Campaign for Drawing’s flagship, with some 1300 drawing events across the UK each October. Check out the Big Draw website by clicking on the Big Draw logo on the left, to find out what events are happening near you. Many of these events are free with materials provided and are suitable for all different ages. This month-long season celebrates creativity and encourages experiment and enjoyment uniting people of all ages, abilities and cultures. It shows how pencil, pen, chalk or the computer mouse can inspire observation, imagination and invention. Drawing connects us with our environment and helps us to see, think and communicate. pre-booking is required for some of the masterclasses and other events so don't leave it until the last minute otherwise you'll be disappointed! There are many different events taking place in London and these can all be found on the Big Draw website. Austin Cole will be speaking informally about why he took to using traditional techniques and their relevance today. Caricaturists will be working to demonstrate their skills and provide you with a fun memento of the day.